Vernon Starfish received a donation of almost $6000 from The Great West Equipment’s Christmas Silent Auction. Because of this, 11 children in Vernon will be fed for the year! 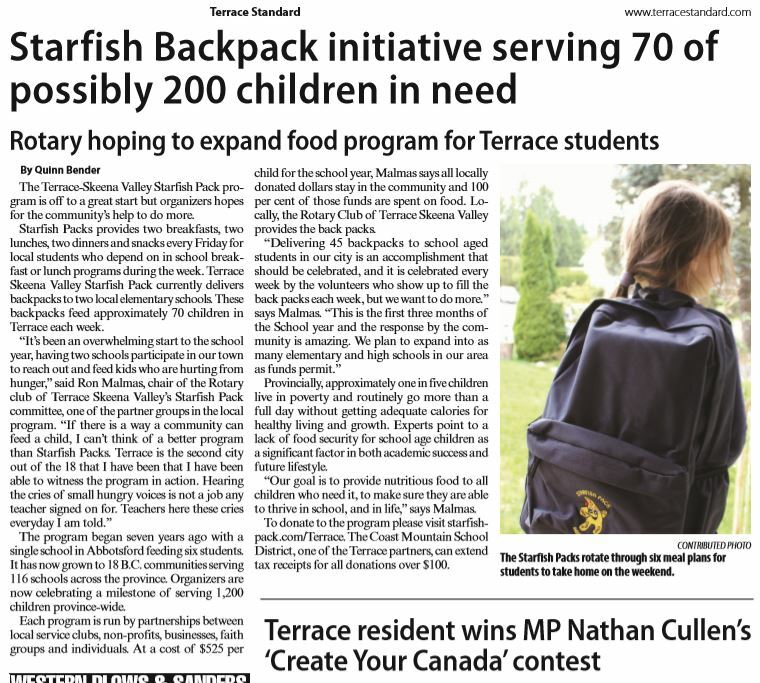 Terrace-Skeena Valley Starfish Pack program celebrates a great start to their program with an article in the Terrace Standard. 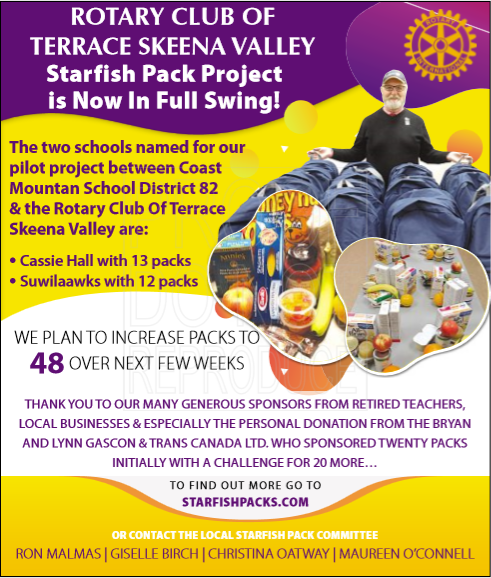 Terrace Skeena Valley is rapidly approaching their goal of feeding 48 children! Thanks to multiple generous sponsors, they will be able to reach this goal soon! See more information on their poster below! 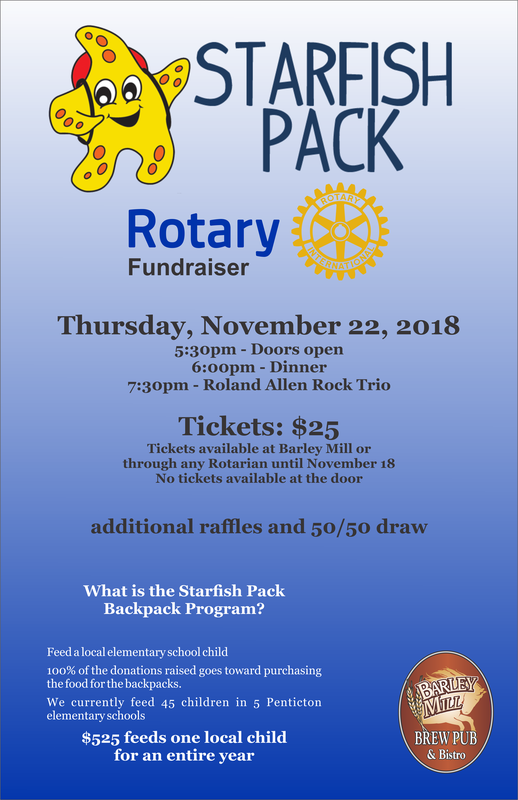 Penticton Rotary Club are selling tickets for their upcoming fundraiser on Thursday, November 22nd to raise money for the Penticton Starfish Pack Program. Tickets available for purchase until November 18th. See poster below for details! Brown’s Social House in Vernon, raised $3000 for Starfish through donating a portion of their brunch sales for the month of September. This past weekend Abbotsford hosted the West Coast Women’s show, where Larry Thomas from Seinfeld raised money for Starfish! This summer was very eventful for the Starfish Pack Program. We were able to offer Summer Starfish Packs to children and their families for the first time ever! Now heading into the fall, and the school year being in full swing, we have been able to expand even more. We are working towards our goal of increasing our numbers to 300 packs in Abbotsford, and are even in the works of expanding Starfish to high schools for the first time through a new pantry program!